While many fears may have subsided with the passage of the Fiscal Cliff legislation regarding individual taxes and other issues, fear, uncertainty and doubt remain over what it means to grow old in America—and how to pay for it. Personal fiscal certainty has gained footing, but the future for America’s seniors remains less certain. “I agree with Democrats and Republicans that the aging population and the rising cost of health care makes Medicare the biggest contributor to our deficit. I believe we’ve got to find ways to reform that program without hurting seniors who count on it to survive,” said President Barack Obama on January 1, 2013 in reference to the Fiscal Cliff deal. The last few years in senior housing have been tough in some respects but fortuitous in others. The industry has faced a lack of construction financing, dips in occupancy numbers, increasing costs, government funding cuts and a weak housing market. These factors have lead to many seniors staying in their homes longer and raising their acuity levels upon entry into a senior living community. Despite these challenges, interest rates have remained at historically low levels, enabling the senior housing industry and consumers some relief from the negative forces of the Great Recession. After almost 4 years of economic challenges, the United States is starting to show further signs of recovery but increasing costs and funding cuts are the “new normal” for senior living. The senior living industry feels that this shift is not a new normal but is just the business reality of caring for aging Americans. With these signs and the slowly improving housing market, providers, communities and consumers are finding confidence as a new foundation congeals. This new foundation, while still drying, will provide the basis for assumptions and beliefs that will drive the next decade in senior housing and living. This foundation provides the construct for this year’s Top 10 Trends in Senior Housing for 2013. 1. It’s the End of Skilled Nursing as We Know It……and We Feel Fine. Senior living professionals have seen changes to the skilled nursing format coming for years and those changes have begun to take shape in earnest within the last 18 months. In 2013, the demise of the traditional model of skilled nursing and nursing homes will begin to accelerate in senior living business as consumers begin to learn that a nursing home no longer has to be the final resting place for seniors. This alone is a stark change from the concept of “warehousing the elderly” that has been a stereotype of over 30 years. The costs to keep someone in a skilled nursing facility are the highest of any part of the continuum of care. The business model of skilled nursing is nearing functional obsolescence in a practical, physical, and economic sense. Additional cuts to Medicare and Medicaid expected in the future and a growing stock of vintage buildings that can’t support today’s care methods will further burden a dysfunctional model. Further exacerbating the challenges of operating skilled nursing in its traditional sense are the risk management measures, costs of insured and increased litigation risk. Combine these challenges with an aging population and increasing demand and limited supply, the world of skilled nursing requires a drastic evolution. With more focus on “person-centered care” and returning people to their homes for comfort, nursing homes will start to appear as more of a surgical strike in the aging process versus the final resting place. The delay, prevention or shortening of any nursing home visit can provide significant savings for the Medicare and Medicaid programs that are due for drastic change. Today’s numbers of struggling seniors are staggering and growing faster every day. With almost 10,000 Americans turning 65 each day, the number of seniors who need specialized housing will only increase the need of affordable housing solutions. Research from the Department of Housing and Urban Development finds that there are over 1 million seniors currently within the guidelines for “worst case housing needs” and increasingly more seniors are falling below the poverty level. The statistical trends support the fact that independent, affordable senior apartments have long waiting lists and new inventory in this category is not being created fast enough to keep pace with demand. Given those trends and the coming changes to entitlements, housing policy needs to have a conversation concerning the challenges the country faces housing its aging population. While federal programs such as the HUD Section 202 Program, Low Income Housing Tax Credits, Housing Choice Vouchers (Section 8) are key to providing long-term housing solutions, regional and local solutions must be part of the plan. Unfortunately the last four years have seen communities reduce their services to seniors in order to maintain their fiscal health. Housing programs and other social services have seen their funding cut in order to maintain other basic health and safety services at these levels. Local community leaders and activists must take charge and raise the issue to the local press and community so that citizens understand that solutions start in their local communities. A strong, local housing program can provide a foundation for jobs, economic and community activities. Local solutions demand local leadership layered with federal assistance and programs, so while the two are separate and apart, they are both inextricably linked. In 2013, local leaders will need to emerge to provide the impetus for long-term solutions to bridge the gap in affordable housing for seniors. What happens when you or your residents outlive their assets? Think of this dilemma not only on a personal basis but also on a retirement community level. Then think about it on a governmental level and you should start to feel sick to your stomach. Longevity will become America’s fiscal and moral enemy. Deterioration of mind, body and assets, both financial and physical, will need to be addressed as part of everyone’s plan. According to the Boston College Center for Retirement Research, the old retirement model used to call for replacing 80% of a person’s pre-retirement income as a target for planning asset consumption and utilization. As the economy finds its footing in 2013, assumptions about aging and longevity will need to be recalibrated. As life expectancies extend further out, many of those assumptions will affect both individuals and corporations. Older, sicker people cost everyone substantially more money. Calculations by the Employee Benefits Research Institution found that almost 44% of those born between 1948 and 1978 will not have adequate retirement income. This number, which spans Baby Boomers and Gen X, assumes that interest rates begin to rise in 2014. Even if interest rates and investment returns rise by 2014, this upward trajectory will be tempered with rising inflation and entitlement reforms on the horizon. The longevity of personal assets will need to factor into a community’s pricing power that will flow into economic decisions regarding the physical structure of the community as well as its professional care profile. On the longer-term horizon, longevity will become much more of a moral problem stemming from providing care for someone whose body is deteriorating beyond enjoyment as well as responsible, fiscal decisions for maintaining a poorer quality of life. The next twelve months is the year of the provider and we’re not talking about the senior care or housing provider. It’s the year of the internet service providers and no, it’s not 1995. Comcast, AT&T, Verizon and Direct TV are the gatekeepers to the home, mobile phones and some senior housing communities. Each provider has a box, phone or gateway that provides connectivity to the digital world and each individual has their fair share of devices and applications that need access to the Internet through their providers interface and connectivity. As more seniors embrace more internet applications further out on the bandwidth curve, they will demand increases based upon their bandwidth needs. These data providers are important as they enable the opportunity for individuals, care providers and community owners to choose their own technology solutions. However, these providers are building their own applications into the interfaces that are used daily such as the cable television interface. Some service providers will compete with independent, third party solutions, while others will choose to invest or acquire these technology solutions to incorporate into their systems. The choice for technology solutions will be for operators, seniors, and their children to decide, but every solution will need to pass through the gateway of the 21st century version of the Internet service provider—which may turn out to be an electronic senior care monitoring service itself. 5. Architecture & Design—Can We Be More Creative than Granny PODS? Guess what? Not everybody is a fan. Stephen Colbert said it best. Like Granny PODS or not, it’s worth the 3 minutes of your time. 6. Senior Housing Finance—Was 2012 the Pinnacle of Activity or Just the Beginning? With many finance firms and banks having record setting years for 2012, will 2013 hold the same fortune in terms of deals and dollar volume? 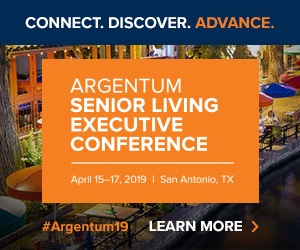 Discussions on Medicare and Medicaid reform and Social Security entitlements will play into the opportunities that lie in the world of senior living. As rates remain low, they will be a driver for M&A activity and refinancing that can free up capital for renovations and expansion for both profit and non-profit owner/operators. Competition for private pay customers will continue to increase and more finance companies will be reticent to engage those with heavy concentrations in Medicare and Medicaid patients. This year will see construction financing become more available but all opportunities for this will be exclusively for those with proven track records of development success, strong credit and liquidity. As the year progresses, new players will emerge into the senior housing capital arena from institutional players to more private equity as a means to follow trends, deploy capital and grow their yields. REITs will continue to be major participants in the M&A and capital finance options for senior living in 2013. As the year progresses, REITs will have to compete with fewer and fewer acquisition opportunities with significant scale, more competition, and rising prices for assets. The pursuit of smaller and middle market players will be a challenge for the larger REITs as these will be more time consuming and not as cost effective. With continued low interest rates and a competitive marketplace, senior housing finance is poised to have another good year but it will be a challenge to match previous years’ transaction volumes in 2013. Pundits, architects and developers have been touting the return of seniors to cities from the suburbs over the past few years. The promise of city living with culture, parks, museums, restaurants, public transportation and more sounds refreshing to older Americans, especially for Baby Boomers living in the suburbs. But everyone seems to forget that city living is more expensive than the suburbs, regardless of the metropolitan market. So does this concept of urban, city living work for those on tight budgets or average retirees, or is this a luxury? Major metro markets have luxury senior living that offers access to the city lifestyle at substantially higher price points. Some of those same cities have affordable housing apartments that may not be in the most exclusive neighborhoods but still provide access to city life. The problem is that many of those apartments are restricted based upon income, age and demographics in those areas, locking out many who would like to enjoy a city lifestyle but fall outside those socio-economic parameters. Given this dichotomy between luxury, urban senior living and a more affordable option, is the concept of middle market city living for seniors a fallacy? It seems as though the middle class senior is being relegated to a semi-urban dream of mixed use properties in a town square or homogenous suburb with a downtown setting. These suburban lifestyle communities may have some of the features of urban living but still require the use of an automobile or need to have access to public transportation to get to the metro center. Walkable, urban lifestyle centers in collar suburban communities maybe a more accurate vision for most than big-city retirement living. During 2013, senior living owners and operators will examine their product offerings and determine their strategy to maximize occupancy, revenue and business opportunities for the future. The process will require operators to evaluate their strategy to attract new and replace existing residents through the use of home healthcare and hospice businesses. The fragmented nature of home healthcare and hospice creates an opportunity for larger players to roll-up these companies and diversify their revenue sources by changing referrals to direct, incremental increased revenue opportunities. Besides traditional senior housing owners and operators, business brokers and franchisors who focus on small home healthcare and hospice providers will be busy in 2013 attempting to build out their networks. While a build strategy may work for small businesses and those with capital constraints, other may find greater advantages to buying existing operations with scale to bring a solution to market quicker. We’ve already seen the Emeritus’s acquisition of Nurse On Call, which is an example of providers looking to expand their services quickly through acquisition. For some, the decision to build out these services or buy will require access to capital markets or the sale of assets to create capital for acquisitions. For others, such as Kindred’s acquisition of IntegraCare, use of cash flow from operations will provide the capital for acquisition that will provide an ability for it to leverage those services to build out its continuum of care. With demand increasing based upon demographics and lack of new supply, many industry professionals see occupancy levels trending higher to above 90% nationally and much higher in some areas with short supply. The challenge for operators will be determining a balance between occupancy levels and increases in prices otherwise known as price elasticity. Compounding these trends, more operators will seek to diversify their revenue streams by luring more private pay customers to their communities. The increased competition for these lucrative customers will add some downward pressure to rising prices in some areas of the country . The next year will see a significant growth of new and additional state legislation for senior care, housing and other services. Why the growth of new legislation and regulation? Blame the local media outlets for sensationalizing the abuse of seniors and making elder abuse segments a regular part of local coverage. Politicians and their staffers will gravitate towards responding to these segments on local news and begin formulating and introducing more local legislation to combat the perceived deficiencies in protecting their elderly constituents. Senior housing owners and operators will face more regulation over background checks, resident safety, licensing and training of employees. As more services are delivered to homes in the community, more challenges will arise as a limited number of state employees to monitor and control senior care are available to regulate this expansion of services. The irony of increased regulations? More costs and burdens on employers and employees and those costs are eventually passed on to seniors and those paying for their care whether it’s adult children or the government. Those are just some of the major trends we see in senior housing for 2013. Have comments? Leave us one below or send an email to [email protected].